Share your Opinion, Shop & Search to earn real cash rewards. Allow Qmee to send me emails regarding competitions, new features, reminders & other promotional marketing messages. This page (together with the policies and other terms it refers to) tells you the terms and conditions on which we supply our service ("our service") including our website www.qmee.com ("our site") and the Qmee browser and mobile applications ("our software") to you, whether as a guest or a registered user. Please read these terms and conditions carefully and make sure that you understand them before using this site, our services or our software. You should print a copy of these terms and conditions for future reference. These terms tell you who we are, how we will provide services to you, how you and we may change or end your use of the service, what to do if there is a problem and other important information. We reserve the right to update or change these terms at any time by amending this page. We will provide notice of changes to the terms by posting the new terms on the site with a new effective date. You are expected to check this page from time to time to take notice of any changes we may make. We may update our site and software from time to time, and may change the content at any time. If the need arises, we may suspend access to our site or software, or close them indefinitely. Any of the material on our site may be out of date at any given time, and we are under no obligation to update such material. We do not guarantee that our site, or any content on it, will be free from errors or omissions. www.Qmee.com is a site operated by Qmee Ltd ("we"). We are registered in England and Wales under company number 07455925 and have our registered office at 8th Floor South, Reading Bridge House, George Street, Reading, RG1 8LS, England. You can contact us by using the Contact us link on our site, or by sending us an email at support@qmee.com. If we have to contact you we will do so by writing to you at the email address you provided to us on registration. Our service is only intended for use by people resident in either the United Kingdom, the United States, Canada or Australia and accessing it from those countries. You should not use our service if you are resident in another country. We do not represent that content available on or through our site is appropriate or available in other locations. We may limit the availability of our site or our service or software to any person or geographic area at any time. If you choose to access our site from outside the United Kingdom, the United States, Canada or Australia, you do so at your own risk. By downloading our software, you confirm that you are legally resident in either the United Kingdom, United States, Canada or Australia, that you are accessing our site from that country and that you are at least sixteen (16) years of age. You may only have one user account. Earnings made on any additional user accounts will not necessarily be paid and we have the right to disable any additional user accounts at any time. The service we make available through our software operates by providing sponsored results when you carry out searches on certain third party search engines, based on your key-strokes. The sponsored results will be displayed in a separate window and are separate from any sponsored results displayed on the search engine's results pages. Subject to your compliance with these terms and conditions, when you click on a sponsored result in the Qmee window we may, in accordance with our user payment policy (as amended from time to time), credit a small sum of money ("a payment") to the user account you have registered with us. From time to time we may offer cash rewards to users who complete surveys. Subject to your compliance with these terms and conditions, when you complete a survey we may, in accordance with our user payment policy (as amended from time to time), credit a reward into your Qmee account. Rewards will only be credited for surveys that are fully completed. There may be additional limitations on certain surveys or rewards so please carefully read all applicable terms and conditions before deciding whether or not to participate in the survey. The contents of the surveys are provided by third parties and such surveys should not be interpreted as endorsement by us of those third parties. We make no warranties or representations about and assume no responsibility for the content of the third party surveys. From time to time we may offer extra rewards for completing certain activities within your Qmee account (e.g. survey streaks). We reserve the right to limit, suspend or withdraw the extra rewards at any time, or to change the rewards offered. From time to time we may notify you through our software if we believe that a product you have searched for online is available for a lower price on a different site. We will make reasonable efforts to ensure that the price offered is up to date and accurate but the prices displayed will be provided to us by those third parties and so we do not guarantee that we will offer you the cheapest available price for the product or that the price is reliable, accurate or up to date. Similarly, while we aim to notify you of a price which is cheaper than the price which you are viewing, we do not guarantee that this will always be the case. Please note that the products offered are provided by third parties and all purchases made will be via third party sites. Your contract for those products will be with those third parties and on their relevant terms and conditions and notification of the price difference should not be interpreted as endorsement by us of those third parties. We make no warranties or representations about and assume no responsibility for the content of the third party sites and we have no liability to you in respect of such purchases. On creating your user account you will be asked to supply your e-mail address and country of residence. We will also store details of the searches you make when using the service. When you make a request to cash out the balance in your user account we may provide you with the option to submit further information, for instance your age or town of residence. You will only be able to receive payments credited to your user account via PayPal or via such other payment provider that we make available from time to time. Alternatively, you can donate them to one of several charities from a list specified by us, or cash out to a giftcard from a list specified by us. To order a gift card you will need to verify your identity. We will let you know how we require you to do this; we might require you to first cash out (any amount) to your PayPal account or we might require you to go through an alternative identity checking service. If you choose to cash out to a giftcard you will be issued a code to redeem your giftcard. We do not hold any responsibility for the code issued and we will not be able to reissue the code. We reserve the right to remove any giftcards offered at any given time. You will be able to redeem your user account balance at any time, however some giftcards may have a minimum redemption threshold (for example, £5/$5). Please see the specific information provided about each giftcard during the redemption process for details of any minimum redemption thresholds. Options for redeeming your user account balance are subject to change on reasonable notice by us. We will not be liable for any payments owed to you in the event that you provide us with an incorrect PayPal account number or other relevant details. We will also not be liable for any payments owed to you in the event of a catastrophic data, software or server error, cyber-attack or other event that makes it impossible for us to determine the payments that have been accrued. We are entitled to suspend your user account at any time at our sole discretion. If your account has not been used for one (1) year or more we will retain the balance in the account, otherwise we will pay the balance of the account to you. We may also suspend your use of our service at any time at our sole discretion. From time to time we may offer a friend get friend referral scheme, to users designated by us. For every referral that signs up to Qmee through your referral link, you will receive a reward into your Qmee account, on their first cashout to PayPal. Referrals must follow your referral link in order for you to receive the reward. We reserve the right to suspend the referral scheme at any time. Access to our service is permitted on a temporary basis, and we reserve the right to withdraw or amend the service we provide without notice (see below). We will not be liable if for any reason our service is unavailable at any time or for any period. You must not allow any other person to use your user account. You must treat your user account ID and password as confidential, and you must not disclose it to any third party. We have the right to disable any user account ID or password, whether chosen by you or allocated by us, at any time, if in our opinion you have failed to comply with any of the provisions of these terms and conditions. We are the owner or the licensee of all intellectual property rights in our service, including our site and our software. Those works are protected by copyright laws and treaties around the world. All such rights are reserved. None of this material may be reproduced or redistributed without our written permission. You may, however, download or print a single copy of any on-screen information for your own private use. If you print off, copy or download any part of our service in breach of these terms and conditions, your right to use our service will cease immediately and you must, at our option, return or destroy any copies of the materials you have made. Qmee is a EU and US registered trade mark of Qmee Ltd. If we fail to comply with these terms, we are responsible for loss or damage you suffer that is a foreseeable result of our breaking this contract or our failing to use reasonable care and skill, but we are not responsible for any loss or damage that is not foreseeable. Loss or damage is foreseeable if either it is obvious that it will happen or if, at the time the contract was made, both we and you knew it might happen. We are not liable or responsible for any failure to provide our service or failure to perform, or delay in performance of, any of our obligations under these terms and conditions that is caused by reasons outside our reasonable control. We are not liable for business losses. We only supply the service and software for domestic and private use. If you use the service or software for any commercial, business or re-sale purpose we will have no liability to you for any loss of profit, loss of business, business interruption, or loss of business opportunity. Nothing in these terms shall limit our liability for death or personal injury arising from our negligence, nor our liability for fraudulent misrepresentation or misrepresentation as to a fundamental matter, nor any other liability which cannot be excluded or limited under applicable law. When providing our service we provide links to the websites of third parties. We assume no responsibility for the content of the third party websites that are linked to. Such links should not be interpreted as endorsement by us of those linked websites. We will not be liable for any loss or damage that may arise from your use of them. Our service is intended to reward normal internet browsing behaviours and you should not click on a sponsored result if you have no genuine interest in that sponsored result or complete surveys inaccurately. If we are of the opinion (or our algorithms suggest) that you are abusing our service, including but not limited to clicking on sponsored results in which you have no genuine interest, clicking on a sponsored result on multiple occasions or completing surveys using inaccurate or fraudulent information, we are entitled, at our sole discretion, to reduce the amount of the payments being made to you or to stop making payments to you altogether. You must not misuse our service by knowingly introducing viruses, trojans, worms, logic bombs or other material which is malicious or technologically harmful. You must not attempt to gain unauthorised access to our service (including our site), the server on which our site is stored or any server, computer or database connected to our service. You must not attack our service via a denial-of-service attack or a distributed denial-of-service attack. By breaching this provision, you may commit a criminal offence under the Computer Misuse Act 1990. We will report any such breach to the relevant law enforcement authorities and we will co-operate with those authorities by disclosing your identity to them. In the event of such a breach, your right to use our service (including our site) will cease immediately. Commentary and other materials posted on our site or otherwise provided by our service are not intended to amount to advice on which reliance should be placed. We therefore disclaim all liability and responsibility arising from any reliance placed on such materials by you or anyone who may be informed of any of such material. The English courts will have exclusive jurisdiction over any claim arising from, or related to, a visit to our site or use of our service although we retain the right to bring proceedings against you for breach of these conditions in your country of residence or any other relevant country. If you reside in the United States, this agreement will be governed by and construed in accordance with the laws of the State of New York without giving effect to any principles of conflict of law. You agree to first bring any case relating to a dispute hereunder to be decided before one arbitrator in final, binding, non-appealable arbitration in New York, NY under the rules of the American Arbitration Association. Each party shall divide the costs equally of such arbitration and in the event the arbitrator decides the arbitration fees would be hardship on you, the arbitrator may allow for Qmee to pay 100% of the arbitration fees (not including your attorneys’ fees, which must be borne by you). You may also participate in the arbitration by phone if you are unable to come to New York. You agree to bring any case hereunder individually and not as a member of any class or part of any type of class action case. YOU UNDERSTAND THAT EXCEPT FOR THE OBLIGATIONS SET OUT IN THIS SECTION, YOU WOULD HAVE A RIGHT TO A TRIAL BY JURY AND YOU HEREBY WAIVE SUCH RIGHT. An arbitration award hereunder may be enforced by any court of competent jurisdiction. Notwithstanding anything to the contrary herein, you agree that Qmee may bring an action relating to its intellectual property rights, including an injunction related to such rights, in any court of competent jurisdiction without using the arbitration mechanism herein. You acknowledge and agree that the warranty disclaimers and liability and remedy limitations in this Agreement are material terms of this Agreement and that they have been taken into account in the decision by Qmee to provide the service. You may not assign any of your rights, obligations or privileges without the prior, written consent of Qmee. This agreement and any Qmee posted operating rules constitute the entire agreement of the parties with respect to the subject matter of this agreement, and supersede all prior or contemporaneous communications and proposals whether oral, or written, between the parties with respect to the subject matter of this agreement, and supersede all prior or contemporaneous communications and proposals, whether oral or written, between the parties with respect to such subject matter. Alternative dispute resolution is a process where an independent body considers the facts of a dispute and seeks to resolve it, without you having to go to court. If you are not happy with how we have handled any complaint, disputes may be submitted for online resolution to the European Commission Online Dispute Resolution platform at the following address: http://ec.europa.eu/consumers/odr/. If you have any questions or complaints about our site, our services, our software or your user account, please contact support@qmee.com. Our service displays some content that belongs to and is made available by third party advertisers (primarily sponsored search messages). This content is the sole responsibility of the relevant advertisers. We may review content for legality and compliance with our policies, and we may remove or refuse to display content that we reasonably believe is non-compliant. However we may not review content as a matter of course, so please do not assume that we do. If you have any concerns about any of the sponsored links displayed as part of our service, please contact support@qmee.com. Qmee Ltd is a company registered in England and Wales (registration number 07455925), whose registered office address is 8th Floor South, Reading Bridge House, George Street, Reading, RG1 8LS, England. Qmee Ltd is regulated by the UK Information Commissioner’s Office (ICO) with registration number ZA169563. We respect your right to privacy and will only process personal information you provide to us in accordance with the General Data Protection Regulation (GDPR) and other applicable privacy laws. If you have any questions about how we collect, store and use personal information, or if you have any other privacy-related questions, please e-mail us at support@qmee.com. You may also contact the Qmee Data Protection Office at dpo@qmee.com. To create an account, you need to provide data including your email address, country of residence, and a password. We will also ask you to allow us to send you information about our services, competitions and other marketing activities; you may refuse or withdraw your consent to this at any time by updating your profile or by contacting us at support@qmee.com. You may also choose to give us other information such as your first name and last name when you create your account. When you use our Qmee browser application we will collect the following information from you: your search terms, details of sponsored links that you click when using our service and details of your behaviour on the sites linked to by our service, namely the pages you browse and for how long you browse those pages. The browser application does not collect any information when you are browsing in privacy mode unless you have explicitly enabled it in the browser settings. When you cash out your rewards we will collect the following information: your PayPal ID, your PayPal address, your PayPal email, your cash out amount and date, your gift card cash out amount and date, your charity cash out amount and date. To receive surveys, we will collect the following basic demographic data from you such as: your year and month of birth, your gender, your postcode, your marital status, education, employment and income range. We will from time to time ask you additional demographic questions to better match you to surveys which you may choose whether to answer. The Qmee mobile application stores information about your phone including your device ID. The mobile application also stores information about the offers you like or click on. We log usage data when you visit or otherwise use our services, including our website, browser app and mobile app, such as when you view or click on content or ads or install or update our mobile apps or browser app. We use log-ins, cookies, device information and internet protocol (“IP”) addresses to identify you and log your use. We also store information about your IP address, proxy server, operating system, web browser and add-ons, device identifier and features, and/or ISP or your mobile carrier. If you use our services from a mobile device, that device will send us data about your location based on your phone settings. We will ask you to explicitly opt-in before we use GPS or other tools to identify your precise location. Qmee will only collect and process your data where we have a lawful basis for doing so. Lawful bases include consent (where you have given us your consent) and “legitimate interests” where the processing of your data is not overridden by your interests or fundamental rights and freedoms. We process this data to have a record of our users. Our lawful basis for processing your data is “legitimate interest”. We do not share this information with anyone else. We will retain this data for as long as your account is open. We will process this data to understand your interests, to deliver rewarded results to you that will be of interest and keep a history of your rewards. Qmee uses an automated system to profile your interests from the searches that you have made. This may cause different or no rewarded results to be shown. The lawful basis for processing your data is “legitimate interest”. We will not share your personal search data with anyone else. We will retain this data for a period of one year. Qmee may anonymise and use your search data for statistical analysis and insight. We may also share anonymised data with partners. We will process this data to retain a record of your transactions with us. This data is retained permanently as part of our transaction records for tax, audit and regulatory purposes. We use this information to match you to eligible surveys. Our lawful basis for processing this data is “legitimate interest”. We share this information with our survey partners so that they can also match you to surveys. Some of our survey partners are located outside of the EEA so will require an international transfer of your data, for details see the section on International Transfers. We will retain this data while your account is open or until you remove it. Please note that without basic profile data we will be unable to match you to any surveys. We may ask you for additional demographic data to improve our ability to match you to surveys; these questions are optional. Some additional demographic data may be special category data which is more sensitive. We will ask you to explicitly consent before we store any such data. We will use this data in the same way as normal demographic data. You may withdraw your consent at any time and we will delete any special category data that we hold. You may control these settings on your profile page. We process this data to ensure that we are talking with the correct user. Our lawful basis for processing your data is as a legitimate interest. We do not share this data. We will store this information while your account is open. Qmee may use all the information we store about you to assess whether you are abusing our service contrary to our terms and conditions and to protect other users of our services. We may also use this data to detect security breaches. Our lawful basis for processing your data in this way is “legitimate interest”. We will retain this information indefinitely. Qmee uses cloud based services for processing and storing your personal data. Qmee currently uses cloud based services based in the USA, such as Amazon AWS and Heroku, requiring an international transfer. These cloud based services have a Data Processing Addendum to their terms of service to ensure compliance with EU privacy standards. We store your personal data while your account is open or as needed to provide you with services. Other retention periods are as described above. This includes data inferred from your use of our services. In some cases we choose to keep data indefinitely in a depersonalised or aggregated form. Qmee allows you to view your personal data on your profile. You can also use your profile to manage the personal data we hold on you and any consents that you have given us. Delete Data: you can ask us to delete some, or all, of your personal data. Change or correct data: you can edit some of your data through your profile. You can ask us correct data if it is inaccurate by contacting us at support@qmee.com. Object to, Limit or Restrict, Use of Data: You can ask us to stop using some, or all, of your personal data (e.g., if we have no legal right to keep using it) or to limit our use of it (e.g., if your personal data is inaccurate or unlawfully held). Some Qmee services may not be available to you if you do not want us to store your data. Right to Access and/or Take Your Data: You can ask us for a copy of your personal data which can be provided to you in machine readable form. Data that we hold because of a transaction with you such as a reward, a cash out or PayPal account details cannot be deleted as these form part of our transaction history. If you think that Qmee has not responded to your requests in a reasonable manner, you may complain to the Information Commissioners Office (ICO) who are our regulator. Please note that when you take part in a survey, the survey partner who operates it may ask you for information (including but not limited to your year of birth, postcode or ZIP code, gender and survey responses). You acknowledge that, by submitting the survey, any such information will be shared with the survey partner. If a third party acquires all (or substantially all) of our business and/or assets, we may disclose your personal information to that third party in connection with the acquisition. They will acquire all of our obligations to you as regards your privacy rights. We may also disclose your personal information where we are required to do so by applicable law, by a governmental body or by a law enforcement agency. We implement security safeguards designed to protect your data, such as HTTPS. We regularly monitor our systems for possible vulnerabilities and attacks. However, we cannot warrant the security of any information that you send us. There is no guarantee that data may not be accessed, disclosed, altered, or destroyed by breach of any of our physical, technical, or managerial safeguards. Take Qmee paid surveys on your laptop or mobile and earn cash rewards. Share your opinions on brands and see your earnings grow daily! Get great money saving coupons and offers for your favorite brands – we’ll help you find the best deals and save money when shopping online. Get money saving coupons and deals on the items you're shopping for to help you save. We'll also show you price savings when we find you a better deal – you don't have to go to different sites to compare. With Qmee, there is no minimum cashout amount so you can get your earnings at any time. 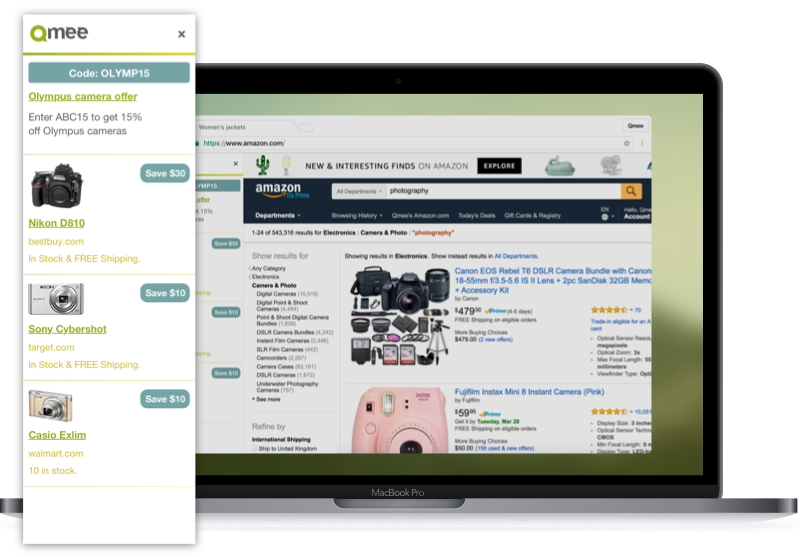 Get the free Qmee browser extension and you can earn cash when you search on your favorite sites and engage with your favorite brands! Go about your daily searching online and earn cash rewards with Qmee results - simply click on the result that interests you to collect the reward in your piggybank. 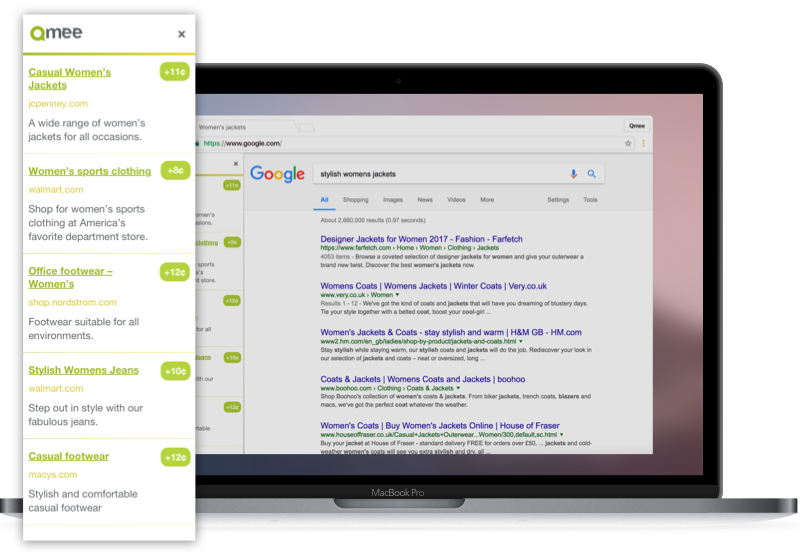 Earn cash when you search on your favorite sites with the free Qmee browser app.